Crucifix Pendant in 14K Two Tone Gold . 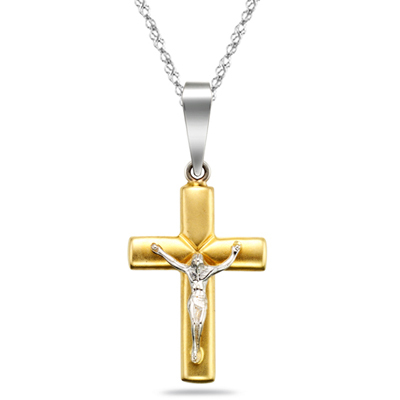 An exquisitely designed Two Tone Crucifix Pendant glows in 14K White and Yellow Gold. The pendant comes finished with an 18-inch 14K White Gold Singapore Chain. The Total Gold Weight of the Pendant excluding the Chain is 2.10 Grams. An impressive pendant displaying sophistication.